For pros, the importance of a solid surfer-shaper relationship can’t be overstated, and there are few shapers as sought after in the foam and fiberglass hustle as Matt “Mayhem” Biolos. Off and on for the last 25 years (since he was a towheaded teen filming his first Volcom part for Magnaplasm) Bruce Irons has had Mayhem on speed dial, and just last week hit him with what many shapers might find an odd request: Bruce needed three boards for the Maldives, but there was a few caveats. He needed a single-, twin-, and three-fin, for the respective divisions at the Four Seasons Maldives Surfing Champions Trophy, to battle Josh Kerr, CJ Hobgood, Freddy Patacchia, Alejo Muniz and a host of other top-tier shredders. Yesterday, Bruce sent us a clip, picking up his shiny new sticks from Gian Bernini and the …Lost crew in San Clemente, and we just had to know more. We caught Matt as he was coming up for air after the week-long bender that is the US Open. Stab: So tell us about this zany lil’ three-pak you made for Brucie’s Maldives mission. He said it was kind of last minute? What did he tell you when he ordered them? Mayhem: Kinda last minute. Not really, though. I kinda lagged actually, because of US Open and Tahiti stuff. 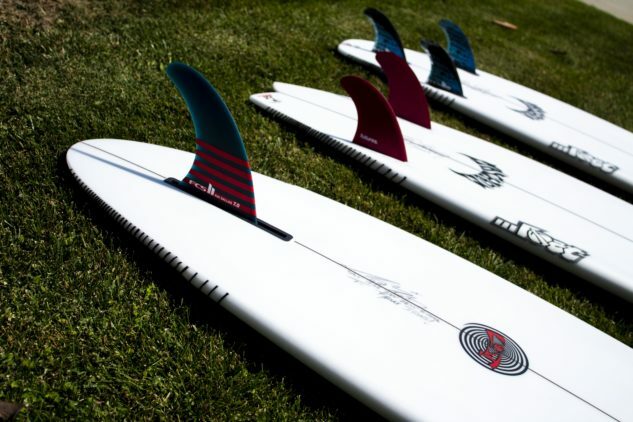 The single-fin is based off an upcoming model, the “Retro Ripper.” It’s 5’9” x 18.88” x 2.32″, with low rocker and 80’s style bottom contours—rolled vee in nose, flat through the middle and a deep spiral vee in tail, with a wing-pin tail. It has a super flat deck, steep angled rails and a forward foil, with beak nose. It’s pretty stylish looking. Like boards I used to help Jim Fuller shape in the mid/late 80’s. The Retro Ripper is meant to be a Tri/Quad convertible, but some of the boys around here were testing it as a single, so I slapped a single-fin on it. It shouldwork. 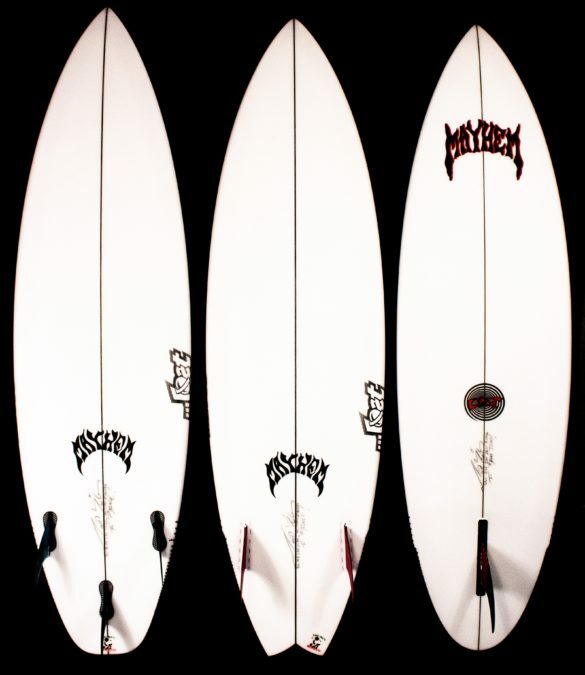 That OG Mayhem logo looks sick on that board. Will you be bringing that back on any models soon? YES! It’s so fun. We are releasing that model “ Retro Ripper” for Fall. It’s got the OG Mayhem , from ‘87, and our little “…Lost Spiral” logo, from not long after. We added some 80’s style rail logos for the full presentation. Just something fun and fresh, for the die-hards. The Retro Ripper is a round-pin, a really fun winter board for guys who usually ride high volume/hybrids in junk, but struggle to find an equally easy board for better surf. Alright, what about that twinny? I wanted to make him a real ripping twin. I made this up from a SubDriver, and put a pulled swallow on it, hoping for some bite. The SubDriver always has a short little vee flip in the last few inches of the tail. For the twin, I carried the vee further forward, so the twins sit in the vee, rather than concave. I added a semi-“stinger” in the outline, lowered the entry rocker a fair bit and hope for the best! It’s 5’8” 18.88 2.32” but I don’t remember the volume. Is the thruster pretty close to what Bruce normally rides? Yeah, he normally rides a 5’11 Pocket Rocket, and ahe thruster is basically a standard 5’11” WCT Pocket Rocket. Over Bruce’s career, he always seemed to like a quick, loose tails. The Pocket Rocket fits that. Also, it’s excellent in little reef waves, where’s there’s a nice cup and pocket to the wave, which the Maldives are. It’s 18.75” 2.32” 27.50 liters. How long you been making Bruce boards? Oh, man. Since about ‘96. We did a lot of boards in the 90’s. He won The Men’s National Title, at Lowers, in ‘97 on one we made him. I still have that board. He qualified for the world tour on an XTR Epoxy that he rode in most his WQS events that year. I let him get away though, for most of his WCT years, but he did nail that amazing cover of SURFER, doing that huge air in the Mentawais, and his incredible segment at the end of Magnaplasm—that was a high point for us together. The last few years, we’ve been doing boards again.